The Christmas tree in the City of Powell’s Village Green Park is just waiting to be lighted for the season. 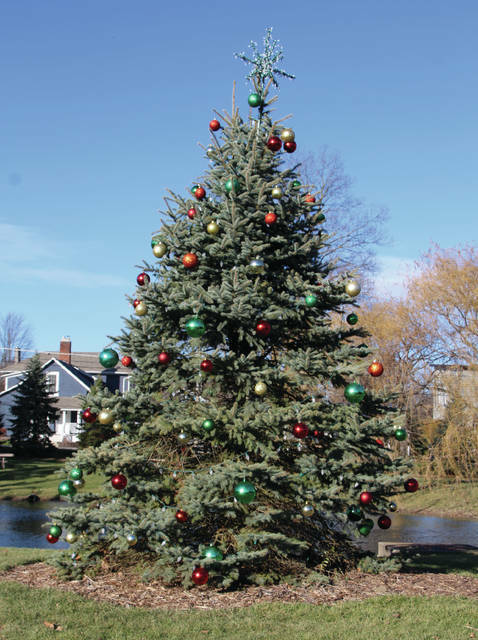 The tree-lighting ceremony is scheduled for 6 p.m. on Saturday during the city’s Holidays in Powell event. Santa and Mrs. Claus and Powell Mayor Brian Lorenz will do the honors. Holidays in Powell starts at 2 p.m. Saturday at the Municipal Building, 47 Hall Street. Admission is free. As the most wonderful time of the year draws closer, the city of Powell is making final preparations for the annual Holidays in Powell celebration. The jolly event will take place from 2 to 5:30 p.m. on Saturday, Dec. 2 in the Municipal Building Council Chambers and East Room, which is located at 47 Hall Street. Holidays in Powell has become a tradition since it was first established 11 years ago. Since then, participation numbers have grown with every passing year, and nearly 750 people attended this merry wintertide fete last year, according to officials from the Olentangy Rotary Club. The event includes winter-themed arts and crafts stations, Christmas storytime hosted by the Delaware County District Library, and a special animal exhibit from the Columbus Zoo and Aquarium for the children and their families. The Olentangy Rotary Club will be serving free hot chocolate and coffee. There will be a visit from Santa and Mrs. Claus, as well as a photo shoot. Village Academy will also be contributing to the celebration by volunteering carolers to sing and bring joy to participants. Every year since Danhart first joined the Village Academy teaching staff in 2013, her crew of 40 carolers, both middle and upper school levels, have been a yearly feature at Holidays in Powell. Danhart’s close connection to the Powell community and to Village Academy has strengthened ties between the two parties, and has helped give joy to the Christmas-hungry kids who attend. According to Powell City Council, Santa Claus along with Mrs. Claus and Mayor Lorenz, will begin the lighting of the city Christmas tree at Village Green Park at 6 p.m. Saturday. “One of our team’s favorite things about this event is to see the excitement and joy this event brings families and their children,” Canavan said. As legend has it, the job of Santa is to bring presents and smiles to the faces of children. But over the years, Holidays in Powell has become another way for Saint Nick, with the help of Powell City Council, to spread more of the Christmas spirit. For information, visit cityofpowell.us. Admission is free.